Simon Sebbag, with his engineering background, produces this chunky--yet incredibly lightweight---sterling silver jewelry in his family-owned Israeli factory. Simon's wife Denise works his designs into fashion-forward collections. Each piece is made with an electroforming process, where a wax mold is bathed in a 925 sterling silver "bath", allowing several layers of silver to adhere. Some have a final layer of yellow gold! The result is a light and comfortable piece, that is then hand-polished to achieve a brilliant shine. Our collection of Simon Sebbag Designs includes pieces that you can build a collection upon! Chunky beads with large holes can be slipped onto leather or gemstone necklaces offered in different colors. Put several beads onto one necklace, or get several necklace colors to change one bead. We also have pins that can be fastened onto the leather cords very elegantly...you can even mix pins with beads! YOU make your own LOOK! Chunky (11/16 inch) custom sterling hook clasp in the back has enough curve to stay closed when worn. 12 slender (about 1.5mm) leather cords are gathered into clasp and drape gracefully around the neck. Simon Sebbag beads are designed to slip over the clasp easily. Select your color and length. Chunky (11/16 inch) custom hook clasp in the back has enough curve to stay closed when worn. Made from sterling with thick final layer of yellow gold. 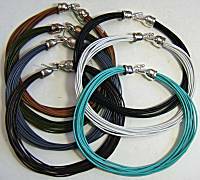 12 slender (about 1.5mm) leather cords are gathered into clasp and drape gracefully around the neck. Simon Sebbag beads are designed to slip over the clasp easily. Select your color and length. Two beads and a pin on black leather necklace...very cool! Sterling silver bead is 1-1/2 inch long, has 5/8 inch inner opening. The design features a pair of sculpted slots that appear to be winking, and will let the underlying leather or stones color show through. 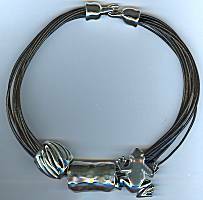 Designed to be worn on Simon Sebbag leather or stone necklace, sold separately. Read about what others think of Simon Sebbag jewelry! Instead of reviews for a specific product, this is a place to share about the designer line in general.